I’ve reviewed two different vanilla slices from St Malo already, but when I went in recently they had yet another type in the display! The first two were very fancy and really good, and labelled as “pistachio mille feuille” and “vanilla mille feuille”, but this one was simply labelled as “vanilla slice”. It also looked much less fancy and more like the sort of snot block you get at a cheap roadside bakery, rather than something produced by an upmarket French patisserie. It had to be tried! The first thing I notice is that it’s quite small. The second thing I notice is the price: a whopping $6. That’s the price I’d expect for something much fancier. Well, I know St Malo is a quality bakery, so hopefully it will live up to the outlay. I fork over my $6 and receive a plate with the slice and a knife – no fork. Not to worry, I plan on tackling it the traditional way, by hand. Katoomba is a small town in the heart of the Blue Mountains west of Sydney, and a perfect destination for a day trip. It’s on the edge of the Blue Mountains National Park, which is part of the Greater Blue Mountains World Heritage Area, and walking distance from some of the biggest tourist attractions in the park. As such, it has a host of shops, cafes, restaurants, and – strung in a sequence along the main street – three bakeries within the space of about 20 metres. They are on different positions along the poshness to down-to-earthness scale. 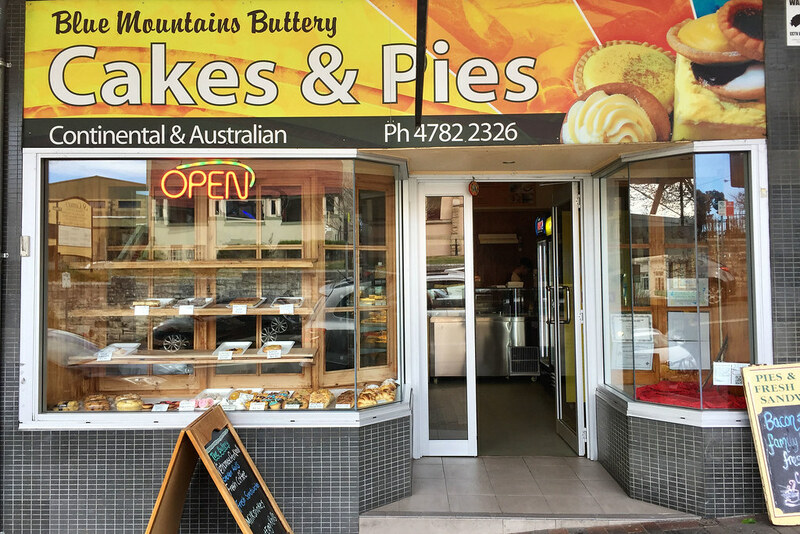 Possibly the most down-to-earth is the Blue Mountains Buttery, which has some good old working-class vanilla slices where the others tend to go for fancier cakes and pastries. 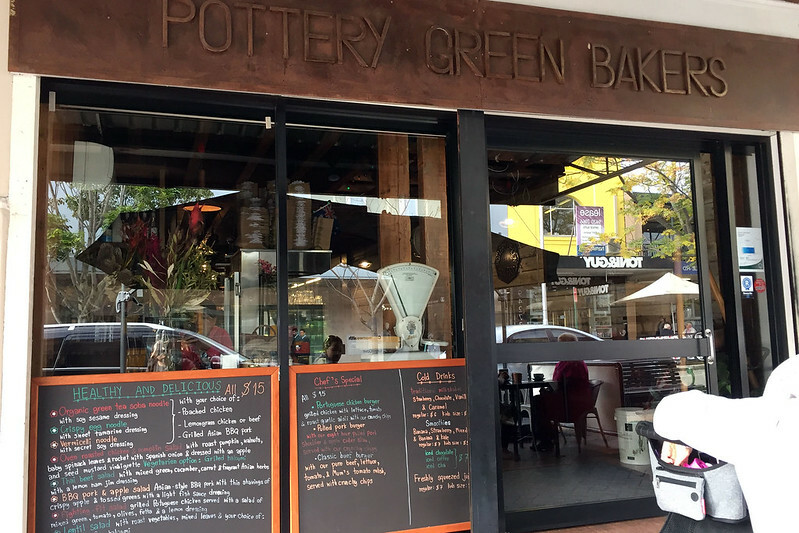 Pottery Green is a cosy and dark nook with rustic farmhouse wooden beams and walls, nestled in the otherwise somewhat run-down main strip of Lane Cove. The interior is cosy and warm in the winter chill, but there are also tables out on the footpath for brave souls or those who want to catch some sun. 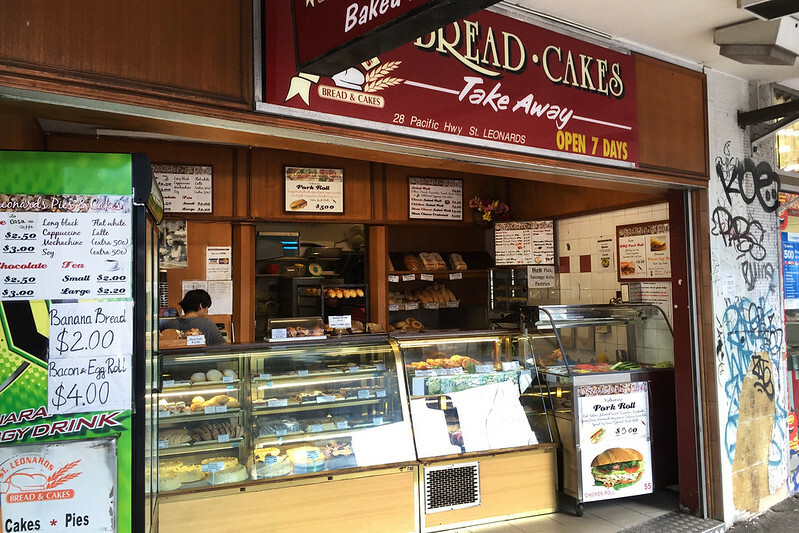 Amidst a tempting selection of cakes and pastries, they have a hot savoury selection boasting two types of sausage rolls: “plain beef” and “pork and veal”, for $4 and $5 respectively. For my first taste I plump for the pork and veal, and accompany it with the traditional vanilla slice. Braving the chill winter air on an outside table, the goodies arrive on two china plates. The pork and veal sausage roll looks great, with a rich golden brown pastry casing, bursting at the ends with generously stuffed, caramelised meaty filling. On a first bite, the meat filling is deliciously moist, with meat juices seeping through the lower pastry layer. The meat seems to have shrunk a bit during baking as it has come free of the pastry tube and slides around freely inside, which makes things a little tricky on the structural integrity front. Driving through the Alps from Switzerland to Italy, we passed through a number of small towns. As lunch time loomed, we stopped at the town of Airolo to look for some food. 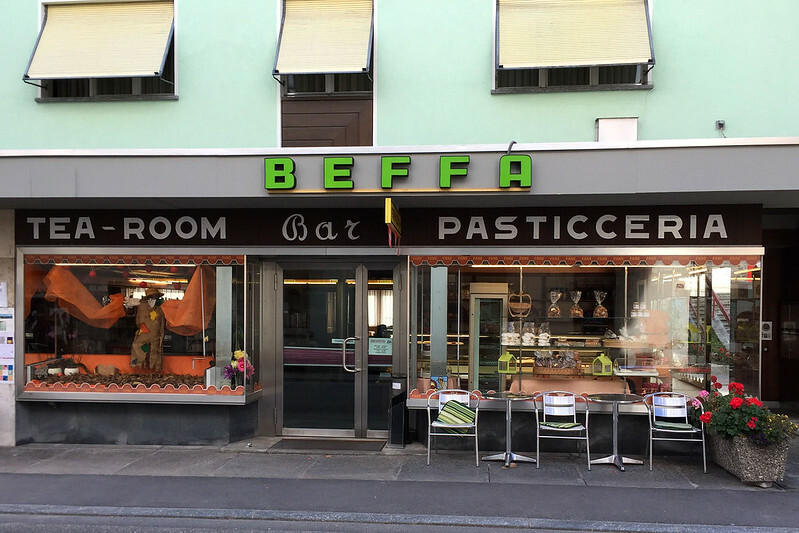 Not much was open, but we found a panetteria and pasticceria called Beffa. Being southern Switzerland, this was an Italian-speaking region. After some halting words with a young lady who didn’t speak any English, we managed to get some panini, freshly made in a back room. And sitting in the pastry display was a set of millefoglie, the Italian version of a vanilla slice. We got a small round table in the dimly lit cafe section of the pasticceria. An adjacent table held five elderly men who were drinking espressos and having an animated discussion in Italian. This was the sort of place where old men gather to while away the hours gossiping with their friends. After eating our sandwiches, I turned my attention to the millefoglie presented on a similarly aged plate. 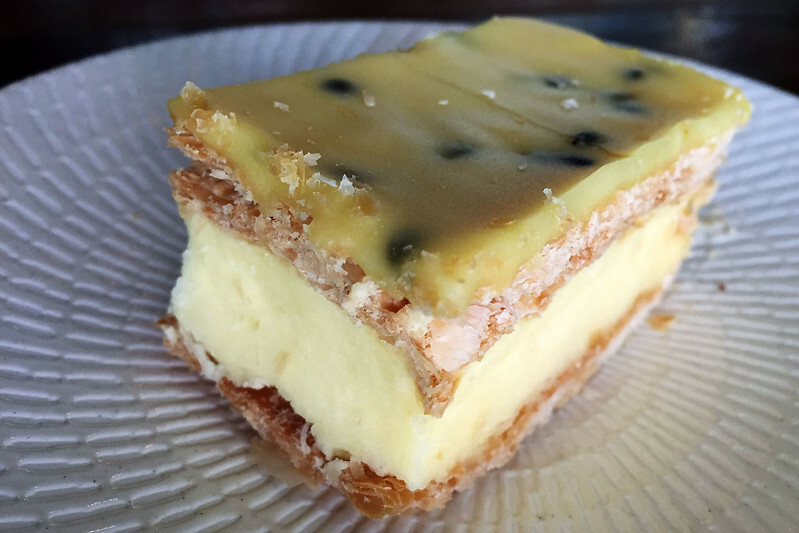 Having already procured lunch from elsewhere, I decided a dessert was in order, and found Homestyle Bakery on the busy main street of Mosman. 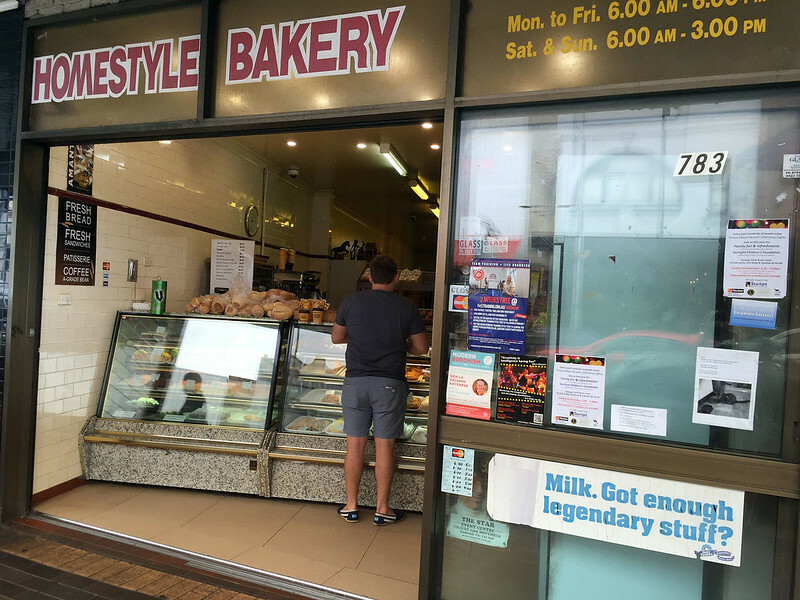 This is one of the anonymous shopfront bakeries with functional but perfunctory ageing steel and glass sliding doors that are ubiquitous in suburbs crying out for a little touch of urban renewal to spruce them up. It’s operated by a Vietnamese woman who serves me with a minimum of fuss, as I photograph the tray of offerings that bears the label “French vanilla sliced”. 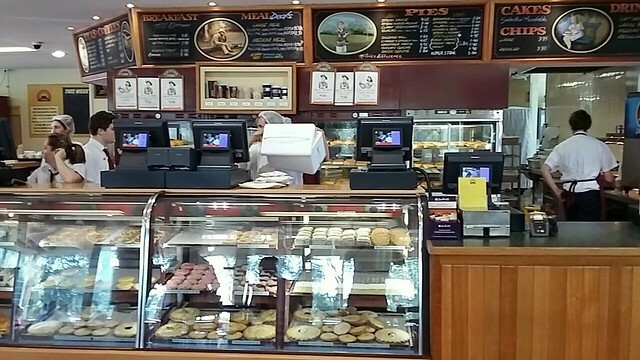 Looking up a local bakery to go for lunch, I had originally intended to go to The Pottery Green bakery at Lane Cove. Upon arriving, they didn’t have any vanilla slices, so I went for a walk and found The Cake Man instead. This is a place occupying both sides of an entire arcade between the pedestrian mall and the parking lot at Lane Cove, a locality in the northern suburbs of Sydney. 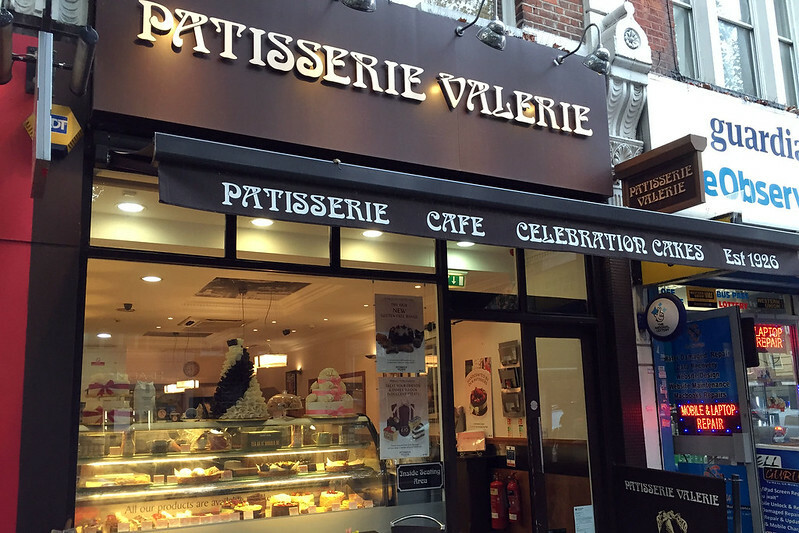 They have a take-away cafe with a few dining tables, a separate fancy cake shop, a restaurant and wine bar, plus their actual bakery and kitchens at this location. 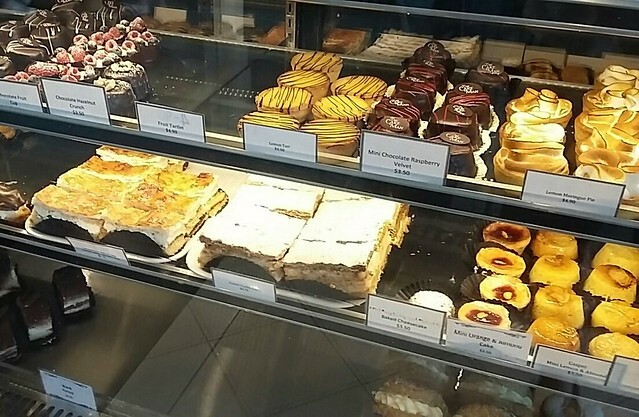 The sausage roll and vanilla slice were described exactly thus by little plaques in the display cabinet and pie warmer – although there was also a “caramelised mille feuille” which looked tempting. The server requested I took a seat at the tables outside, and the items were bought out to me on little plates with serviettes and cutlery. 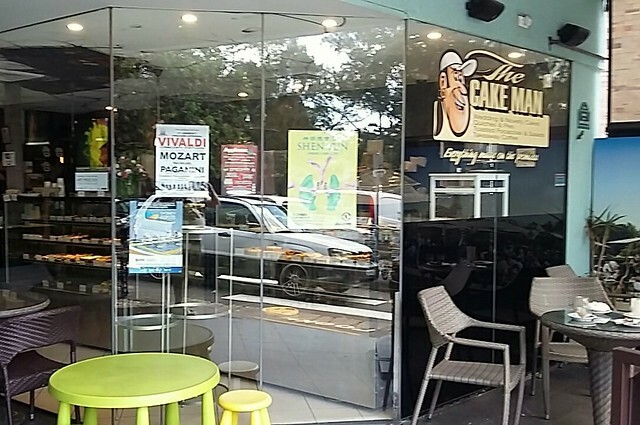 This is a mostly anonymous hole-in-the-wall bakery on the heavy traffic road of the Pacific Highway as it cuts through the suburb of St Leonards. It’s so anonymous that the signage can’t even seem to decide if it’s called “St Leonards Bread & Cakes” or “St Leonards Pies & Cakes”. The shops fronting the major bus stop here have a gritty, run-down feel, with traces of graffiti on the walls, and this place is no exception. It’s operated by a Vietnamese family, and so naturally the French style bread hot from the oven is delightfully soft in the middle and crusty on the outside. They offer a fresh hand-made Vietnamese pork roll, which seems popular, as well as a range of the usual standards. I secured a sausage roll for $2,70 and a vanilla slice for $3. Being no places to sit in the immediate vicinity, I walked 50 metres or so to the nearest intersection, where a blocked off side street offers a tiny refuge from the traffic with a couple of bench seats. 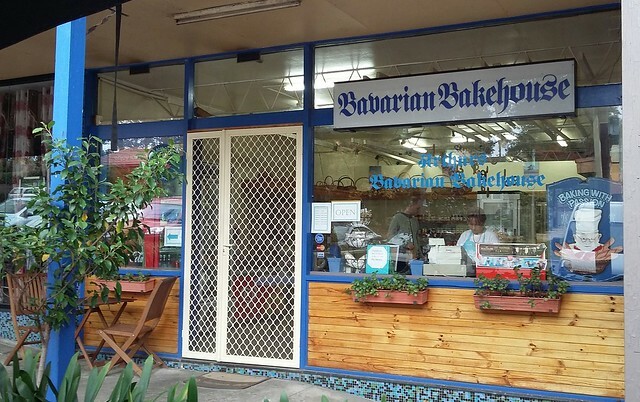 Arthur’s Bavarian Bakehouse is located in a tiny cluster of shops and restaurants in a quiet suburban street, one block away from the highway at West Pymble. I’ve known about this place for about 15 years and I don’t think anything about it has changed in all that time. They sell a selection of freshly made German style breads and pastries, plus homemade pies, sausage rolls and vanilla slices! There’s also a selection of German household groceries. The window display proudly declares “Baking with passion”, and the planter boxes and little tables create an inviting friendly atmosphere. I buy the products from the friendly server and take two brown paper bags to the tables and chairs just outside the front door.